Last week, I wrote about Kentuckian James Still’s 1940 novel, River of Earth, which chronicles the lives of a southern Appalachian family who must leave their subsistence farm to seek work in the coal mines. Just one year earlier, John Steinbeck – born and raised in Salinas, California – wrote The Grapes of Wrath , without a doubt the novel of the Great Depression. Steinbeck, who had been raised by his parents to have great compassion and empathy for his fellow human beings, was horrified by what he saw happening in his home county and throughout the Central Valley of California. During the 1930s, up to half a million migrants came to California from Texas, Missouri, Arkansas, and especially Oklahoma. When they arrived in California, they discovered a glut of laborers – migrants like them who had fled west to look for work when their farms back home had dried up and blown away in the Dust Bowl. As a result, it was hard indeed to find work in California – and when migrants did find employment, wages were very low, and living conditions were terrible. Steinbeck set out to write a novel that would depict not just one family but also the whole mass of people who were displaced and hungry. As he tells the story of one Oklahoma family – the Joads – losing their farm, packing up their worldly possessions, and traveling Route 66 to look for work in California, Steinbeck weaves in what he called “interchapters” to show that the Joads are a microcosm of what was happening on a much larger scale. ER was not the only reader who found The Grapes of Wrath compelling. It was the bestselling book of 1939 and won the National Book Award and the Pulitzer Prize for Fiction. When Steinbeck was awarded the 1962 Nobel Prize for Literature, it was largely due to the impact of The Grapes of Wrath. In 1940, the book was made into a successful film , directed by John Ford and starring Henry Fonda as Tom Joad. Though the film tones down Steinbeck’s political messages and gives the story a more upbeat ending, it has nevertheless become a classic in its own right. That same year, Woody Guthrie wrote a two-part song – “Tom Joad, Parts 1 and 2”; it appeared on his album Dust Bowl Ballads . Despite – or perhaps because of – its success, The Grapes of Wrath was widely banned and burned, including in Kern County, California, the county where the Joads end up at the novel’s conclusion. Some people – including the Associated Farmers of California – labeled the novel “Communist propaganda.” For more on the backlash against the novel, check out Rick Wartzman’s book, Obscene in the Extreme: The Burning and Banning of John Steinbeck’s The Grapes of Wrath . An excellent NPR piece on the topic includes an excerpt from Wartzman’s book. Sadly, even the citizens of Steinbeck’s hometown of Salinas turned on him after the novel’s publication, branding him a traitor to the middle class. Salinas is now home to the National Steinbeck Center, but the town was not especially friendly to Steinbeck while he was alive. If you haven’t read The Grapes of Wrath or if it’s been years since you have, I highly recommend it. Though it is dismissed by some as an “issue” novel, I believe it is a grand, sweeping, epic story of the American people. While you’re at it, pair it with James Still’s River of Earth. The two novels will give you glimpses into two outcomes of the economic crises that gripped America in the 1930s. The novels were published within a year of each other by the same publisher, bringing to light the desperation of Americans who were losing ties to their own land and who were, as a result, rootless, homeless, displaced. For more on Steinbeck and The Grapes of Wrath, watch C-SPAN’s American Writers episode on the author and the book. These two-hour episodes are always so very well done – complete with on-site expert interviews. Watch:Watch Henry Fonda, in his portrayal of Tom Joad, as he gives his “I’ll be there” speech near the end of John Ford’s film adaptation of The Grapes of Wrath. The clip runs 1:20. 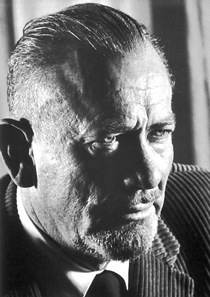 Image Credit: John Steinbeck in his 1962, when he was awarded the Nobel Prize for Literature, public domain.